I was 20, in college, day dreaming about my dream-life in Spain. I dreamed of sunny days in parks that have been around for centuries. I imagined myself walking through museums studded with Picassos and Goyas. I saw myself meeting my friends for tapas, all while having deep, Hemingway-esque conversations. Within months I was actually in Spain, living this dream. While I was fortunate to experience each of these things while teaching English in Spain, I came back to the U.S. with a thirst for something more….but still in a Spanish accent. My thirst was satiated upon my next trip to Central America…and then again to South America and Mexico and beyond. Before, I had seen Spain as the end all be all of the Spanish-speaking world, but experiencing Latin America changed this, and my world, entirely. So, if you want to learn Spanish and enjoy a tremendous international experience teaching English abroad, here are 11 of the many reasons to consider teaching English in Latin America rather than Spain. Do you know where in the world the cleanest Spanish is spoken? No, Spain, the origin of the Spanish language, is not it! It is….drum roll….Colombia! It may come as no surprise that during my time in Madrid, I had to adjust to the slang and accent used only on the Iberian Peninsula. It came as a surprise to me, though, that my friends from Latin America also had trouble understanding Spaniards as they use a dialect unique only to Spain. Also, in certain regions of Spain like the Basque Region & Catalonia (where Barcelona is located), regional tongues are often used more prominently than Spanish itself. So go and learn the most international Spanish in Latin America! In Madrid I taught 100% freelance as a private tutor. I traveled around Madrid to meet up with the students I tutored. While I loved the life that my work lent me, I never got to work in an actual classroom setting. This is typical for teachers in Spain (especially Americans), even for teachers with extensive work experience! 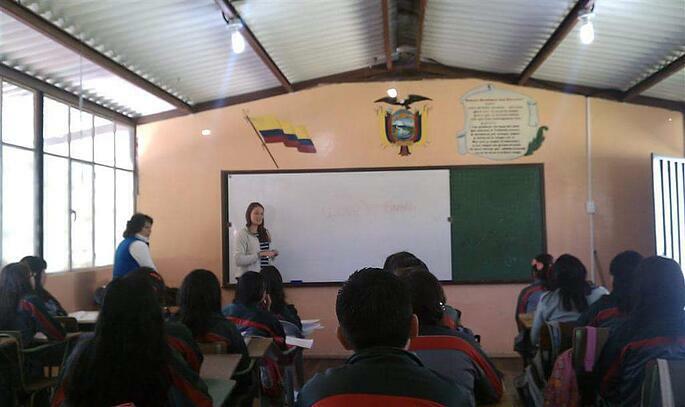 In Latin America, there are more opportunities in more classical teaching settings. Even without teaching experience, ITA graduates teaching in Latin America have scored positions in universities, marketing firms, language academies, consulates, law firms, etc. Go diversify your international resume in these markets! In Spain, it can be more difficult for Americans and other citizens of non-European Union countries to get work visas. In fact, apart from those who are teaching through the Cultural Ambassadors Program (which is very competitive and only accepts applications once a year) or on a Student Visa (which requires paying for a year of classes and going through a length visa application process), the vast majority of Americans teaching English in Spain do so "under the table" without a legal work visa (this is illegal, but commonplace). Well, in countries like Mexico, Chile, Colombia, Ecuador, and other nations in Latin America, it is much easier to get a legal work visa. 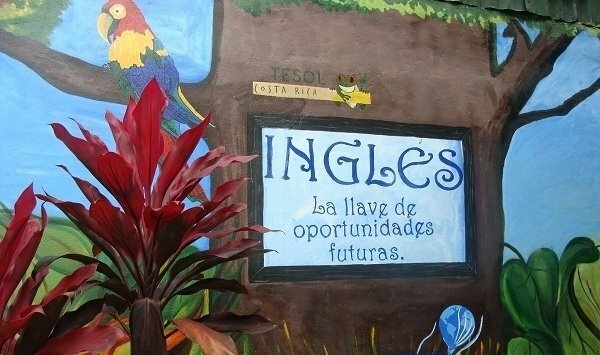 In other countries like Costa Rica & Nicaragua, foreign English teachers work on a tourist visa that can be legally renewed by "border hopping" to neighboring countries every 90 days. Confused by all this visa talk? Check out this article: What is a Visa & Do I Need One for Teaching English Abroad? To obtain my job in Madrid, I hit the ground there interviewing in September. Outside of this hiring season (or in January), it would have been much harder to find teaching gigs in Spain - especially outside of Madrid. Spain has very strict hiring seasons. 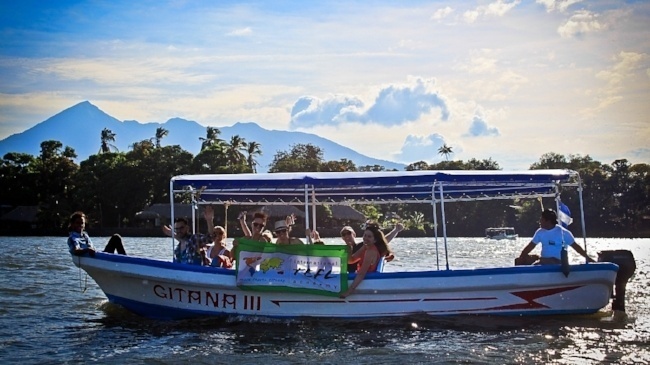 If you want to go abroad and teach NOW, Central American countries like Costa Rica, Mexico, Nicaragua offer many opportunities to do so virtually year-round! offer teaching opportunities all year round! Don’t wait to get abroad…go now! In Spain, unless you apply to participate in the Cultural Ambassadors Program, you absolutely have to be on the ground to interview for a position. Many jobs in Latin America do work that way as well. But if getting hiring on the ground is a deal breaker for you, you have options in Latin America! Some schools in Colombia (including government public school teaching positions), Chile, Mexico, Brazil, Costa Rica, Ecuador, and Mexico do hire in advance. This means you can get jump started on your TEFL course, start using our job search assistance, and begin interviewing from the comfort of your own home. You can be interviewing with those schools in Latin America….and you can also be interviewing with schools in all over the world that offer interviews in advance (South Korea, the UAE, Turkey, among many others!). 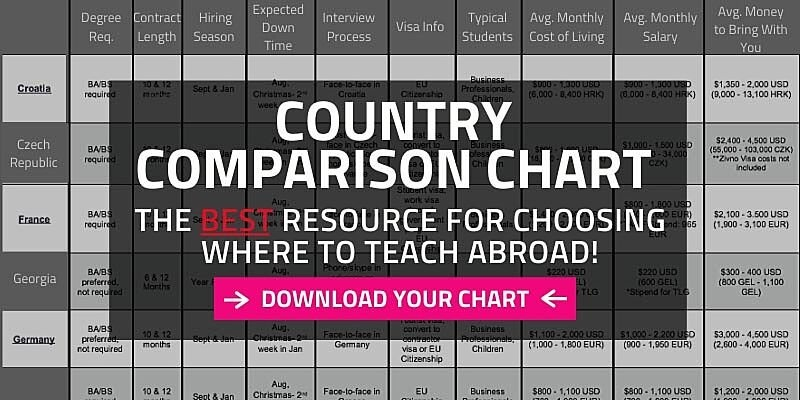 Then you are able to compare the different opportunities you are offered, chat with alumni in those countries, and speak to other English teachers at that school so you can make an informed decision as to which school will be best for you! One of the best parts of teaching abroad is full immersing yourself into the culture of the country you are teaching in. That being said, you will still want to keep in touch with family and friends back home. In Latin America, you are in the same time zones as the USA and Canada, which makes it amazingly easy to keep in touch on apps like Skype & Facetime. Also, on longer holidays, teachers can even pop back up home to the States for an affordable visit! Meanwhile, the time difference between Los Angeles and Madrid is 9 hours! As we know, the cost of living throughout Latin America is much more affordable that in Europe. 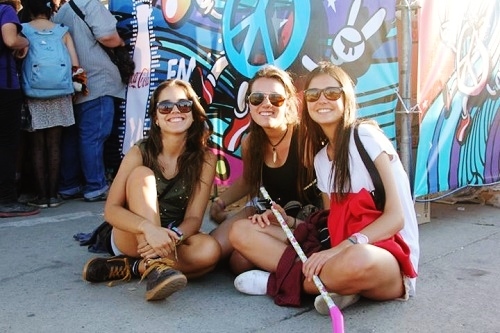 This also means that you can travel very easily and affordably throughout Latin America. While Spain has a great train system, you can get your both your travel on and your adventure on throughout Latin America via planes, trains, automobiles…..boats, motorcycles, chicken buses…..often for a fraction of the price. 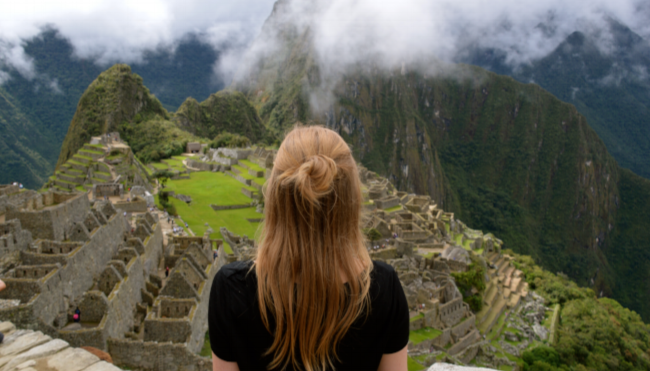 To learn more about getting the most our of your $$ while living & traveling in Latin American, check out 5 Tips for Budget Travel in Latin America. Or: there is a bit of everything! Spain is a stunning country where you get to live a bit of that European fairy tale. 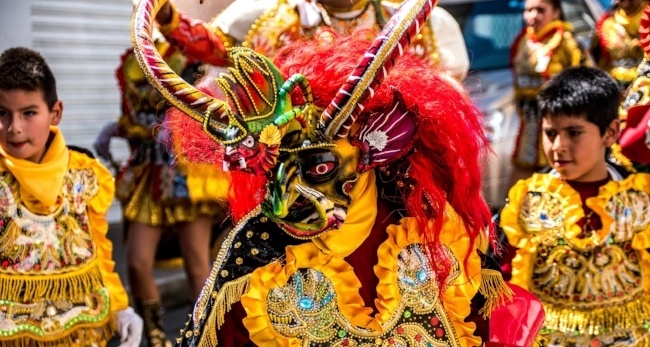 In Latin America, you can find that vibe, but also within a couple hours be volcano boarding in Nicaragua, motor biking through the Cocoa jungles of Colombia, hiking in Patagonia, skiing in Chile, surfing in Brazil, zip lining in Costa Rica, shopping the trends in Argentina, scuba diving in Mexico……and the list goes on! It is almost ridiculous to talk about Latin America as one entity because of the diversity not only within the region, but also within each country! As a teacher in Latin America you will meet amazingly diverse people traveling through all terrains, listening to different dialects, and learning about the history and culture unique to each corner of the region. 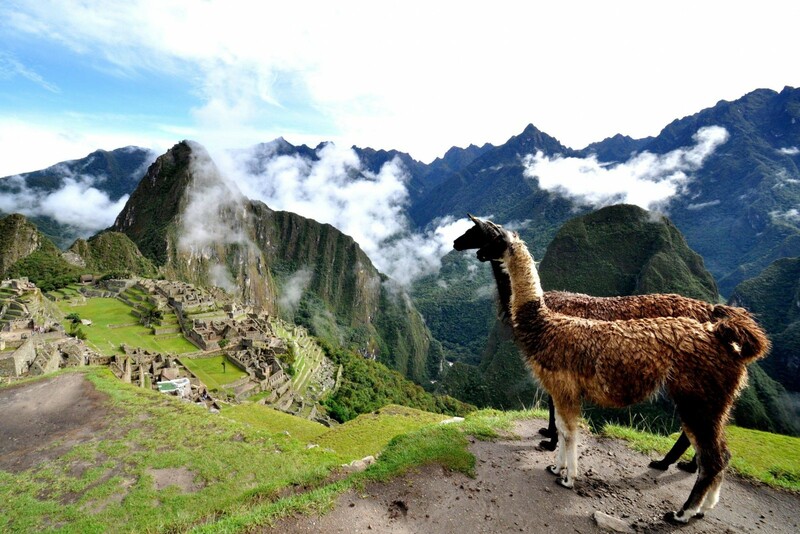 If you want to see it all and do it all on a budget, Latin America is for you! Give it a try! Want to Learn More about Teaching English in Latin America & Around the World? Request a free brochure or call 773-634-9900 to speak with an expert advisor about all aspects of teaching English Chile and around the world, including TEFL certification, the hiring process, salaries, visas and more. 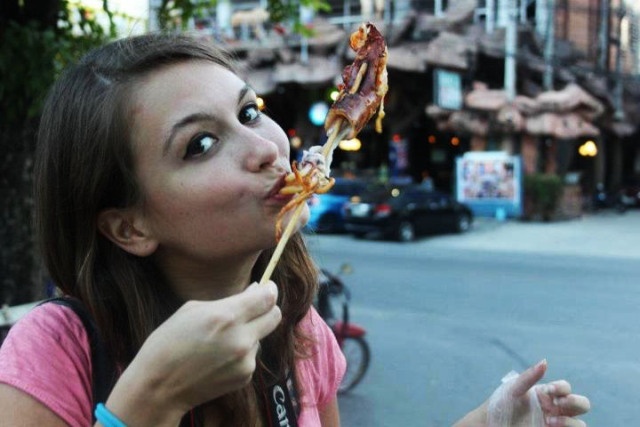 A western girl at heart, International TEFL Academy Admissions Advisor Helen grew up in Texas and New Mexico, and gained her love of travel on her first trip abroad to India. From there she knew she wanted to travel and see as many cultures as she could. 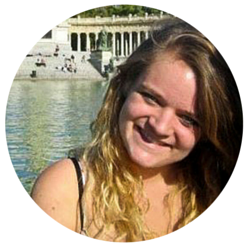 Helen had the amazing opportunity of living and teaching in Madrid for a year. She traveled all over Europe, but her favorite places ended up being right in Spain. She continually works to improve her Spanish and is excitedly looking forward to a trip to Latin America in the near future.